We forget stuff over time, if we don't practice it. What does that mean for Knowledge Management? The human brain learns and remembers stuff, but it also forgets stuff too. We know all about learning curves, but also need to realise there is a forgetting curve. The brain discards knowledge it feels is irrelevant or not urgent, then begins to subtly alter the remaining knowledge so that it fits with our preconceptions. We learn, we fill our brain with knowledge, then it begins to seep away. There are plenty of studies that show this effect. This reference, for example, suggests that, on average, students forget 70 percent of what they are taught within 24 hours of the training experience, unless given frequent "boosters" or reminders to keep the knowledge fresh. We found in our Bird Island exercise that having done the exercise before did not help people perform better a few months later. And Daniel Schachter has written a whole book on how the mind forgets and remembers, reviewed here. Telling people something does not give them lasting knowledge unless they have a chance to use and practice it. Therefore it's best to have the Telling as close as possible to the Using. This speaks in favour of pull-based KM, where people seek for knowledge as and when they need it, rather than push-based knowledge. Leaving knowledge as tacit "head knowledge" will work if an activity is regularly practiced or happens on a regular basis. The regular ongoing nature of the activity keeps practice knowledge fresh (the lower chart in the diagram above). This is particularly true of communities of practice. Connecting up people from multiple parts of the organisation makes it more likely they the activity is being practiced somewhere, and therefore that someone in the community has fresh experience and knowledge. It's called a Community of Practice, because the knowledge is being practiced by the community. 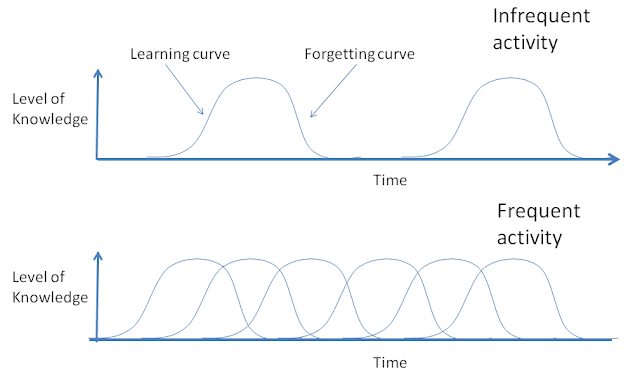 When knowledge is infrequent or irregular, then keeping knowledge as tacit "head knowledge" is a risky strategy (the upper chart in the diagram above). We may think we can remember an activity we did a year ago, but the chances are that we can't recall any reliable detail, and many of the things we remember are false. In situations like this we need to document knowledge as best we can, both as an aide memoire to the knowledge which still remains deeply buried in our heads, and as a replacement for the knowledge we have forgotten. Because we WILL have forgotten huge chunks of it. Therefore knowledge of the routine operations of a factory, for example, can safeuly be left tacit. The operators deal with this knowledge day-in, day-out, and can keep it fresh in their heads. The knowledge associated with the non-routine operations however - the emergencies, the process upsets, and the maintenance shutdowns - probably needs to be recorded and stored, because you wont be able to trust the operators' memories from the least time something similar happened. The type of activity, and in particular the frequency by which we will practice it, can make a huge difference to the way you manage the associated knowledge.